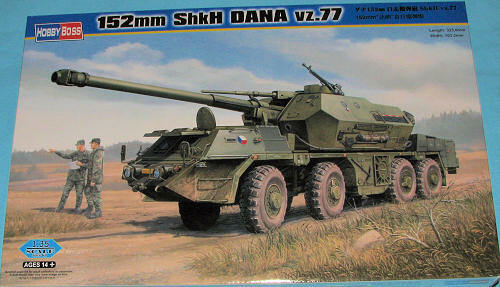 The Dělo Automobilní Nabíjené Automaticky (self-propelled auto-loading gun), also known as Samohybná Kanónová Húfnica vzor 77 (ShKH-77) (self-propelled gun howitzer model 77) was designed by Konštrukta Trenčín and built by ZTS Dubnica nad Váhom in the former Czechoslovakia (now Slovakia) as the first wheeled 152 mm self-propelled artillery gun to enter service. It was introduced in the 1970s. It is based on the 8x8 Tatra 813 truck, the best off-road truck at the time. Currently it is in service with the Czech Republic, Libya, Poland, Georgia and Slovakia. Wheeled vehicles have the advantage of being cheaper to build and easier to maintain with greater mobility. Tire pressure can be regulated to allow good mobility off-road and there is power-assisted steering on the front four wheels. It lowers 3 hydraulic stabilizers into the ground prior to firing, and has a roof mounted crane to assist with ammunition loading. The crew of the DANA consists of the driver (operates the hydraulic stabilizers) and commander sitting in the front cabin, the gunner (aims the gun and opens fire) and loader operator (selects the appropriate amount of powder charges) are on the left side of the turret, the ammo handler (sets the shells' primers) is on the right side turret. I don't follow armor as much as some but I have to say that I was quite impressed with this one when I opened the box. Hobby Boss has put a lot of effort into providing us with a very detailed kit of this rather large SPG. There are a box full of sprues in tan plastic as well as three photo etch sprues of various sizes, a cable and eight rubber or vinyl tires. One can slip the tires over the wheels after painting the chassis if one so desires. Rather than the more usual method of covering the breech area of the gun under one large armored 'turret', this one has the crew in two equal sized pods on either side of the gun. Small these pods are not and one contains the defensive machine gun, handy if enemy troops are sneaking up on you. Photo etch is used for various intake screens as well as for attachments for a number of externally mounted items. This is not a curbside and comes with a full engine in the rear as well as a fully detailed cab section for the driver and I suppose the vehicle commander as there seems to be a radio in there with them. Basically, one does this as two kits. One is the truck portion complete with the engine and running gear. The other is the gun section with the crew pods on either side. The truck part takes up about 60-65% of the instruction sheet so it is here that one will spend a goodly amount of time. The instructions are superbly done as they are on all Hobby Boss kits. 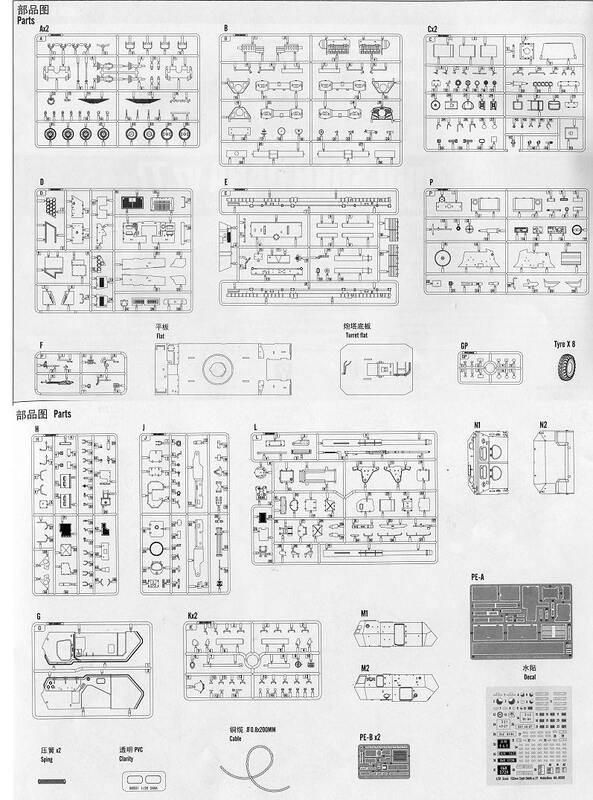 There are 34 construction steps in the book itself and while this means a lot of parts, actual assembly does not appear to be difficult at all. It will just be something that will take time to assemble. The vehicle is shown in the instructions being built in the firing position, which means the side and aft support pedestals are down. I suppose one could build it with the pistons on these in the up position, but the instructions don't offer than option. There are markings included for four vehicles. Two are in the overall Olive color as shown on the box art. The other two are a variegated camo pattern with a base shade of light green. One has the smaller camo colors in flat black and dark green while the other is in flat black with a brown. None of the vehicles are identified as to unit or country, though obviously the box art one is Czech. 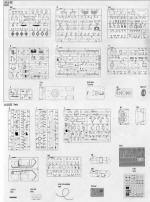 The decal sheet provides data information and license plates. So there you have it. A very cool and what should be a very large SPG kit that is different from the norm. Hobby Boss is to be commended for taking the effort to produce this vehicle. I'm sure that we will see other variants of this in the future.